The NCAA Tournament is a blitz of basketball insanity. Sixty-seven games play out over just a couple of weeks, which means you’ll need to find ways to watch while on-the-go, at work, at the gym, or waiting in line during a quick run to the store. That’s why you need our March Madness survival kit so you don’t miss a thing. 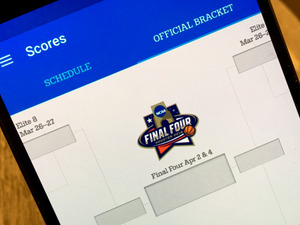 With these free apps you’ll be able to stream the game, follow your bracket, and catch all the scores from your phone or tablet. You’re on your own for bracket advice, though it’s not like you’re going to pick anyone besides undefeated Kentucky to win it all, anyway. Top priority: Grab the official NCAA March Madness Live app, which streams every tournament game. The details, however, are a little complicated. You can watch every NCAA game on your phone or tablet, as long as you sign in with a cable or satellite TV account. Here’s how it works: any of the games broadcast by CBS are available for all to view. But those shown on TBS, TNT, and TruTV require you to login with a cable or satellite TV account. So you’re out of luck if you’re a cord cutter, unless you “borrow” someone else’s account details. Fortunately, all the Final Four games will be on CBS, so you won’t need to miss any of those. The app also will stream three distinct broadcasts for the final, two geared towards fans of each team and another with announcers giving it to you straight. There will be some times when you need to peel yourself away from your vigil in front of the screen. 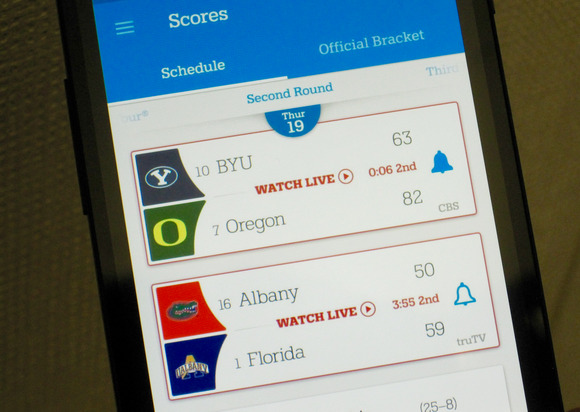 While the March Madness Live app does a pretty good job of sending out alerts on close games, it’s not as practical for quickly finding a score on a specific contest. ESPN’s new tablet-friendly Android app gives you scores, video, and relevant tweets. 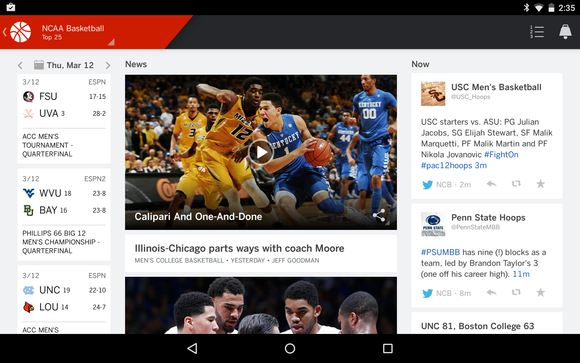 The ESPN Android app is the best option. 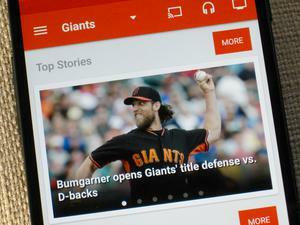 The app just underwent a major redesign, including new optimizations for Android tablets. Create or sign in with your ESPN account so you can set notifications for specific games or scope out the rest of the bracket. Landscape mode especially is great on tablets, with a columns for scores, videos, and tweets from the team’s social media accounts. Another favorite of mine is the CBS Sports app. 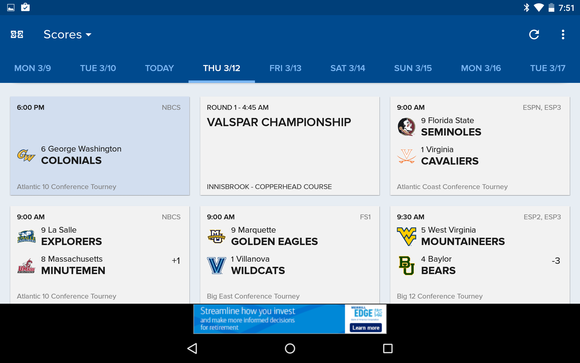 It has a great Material Design interface and, just like ESPN, will track your favorite teams or let you customize which contests to get persistent notifications about. The CBS Sports app showcases excellent use of Google’s Material Design. 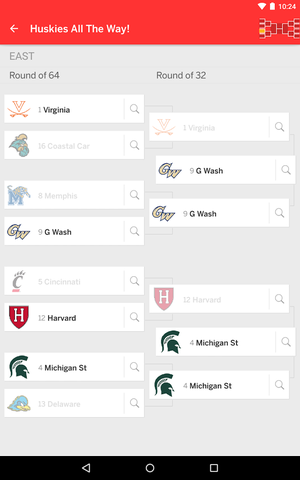 Both apps also let you create a bracket that syncs back to the main website. So if you’re using ESPN or CBS to track your predictions you can find out instantly how well you’re doing. Yet sports isn’t just about who wins the games. Team news, gossip, and banter are just as much a piece of the experience. This is why Team Stream by Bleacher Report is always fun. It’s like TMZ for sports, with some bombastic-yet-entertaining opinions and updates about the world of college basketball and beyond. Part of the fun of March Madness is filling out a bracket. Whether you’re playing for money or bragging rights, you’ll want instant updates on the tournament. ESPN Tournament Challenge connects you to the sports behemoth’s bracket challenge. You can track progress and see how you’re doing compared to the rest of the ESPN community and your buddies. 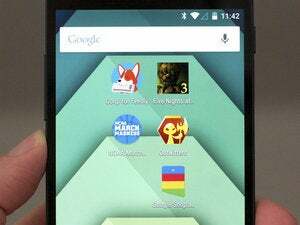 Unfortunately, the app is only designed for phones, so it may look out of place on a larger tablet. Follow your ESPN bracket and find out how good you are at predicting this year’s tournament victors. If you’re using CBS Sports for your bracket, you can follow it through either the March Madness or CBS sports apps. Act fast, because the First Four begins Tuesday, marking the opening round for the field of 68 teams. These apps will really come in handy on Thursday and Friday, with 32 games over two days, typically accompanied by numerous buzzer beaters and upsets.